Check out Tobi's Trinity Wrap Skirt Wrap it up - there's no question you'll be the most stylish one around with the Trinity Black Wrap Skirt! This mini tulip skirt features a linen weave, self-tying wrap, and a high waisted fit. Perfect for work and play, pair with a bodysuit for some extra chic points. Wrap it up - there's no question you'll be the most stylish one around with the Trinity Black Wrap Skirt! 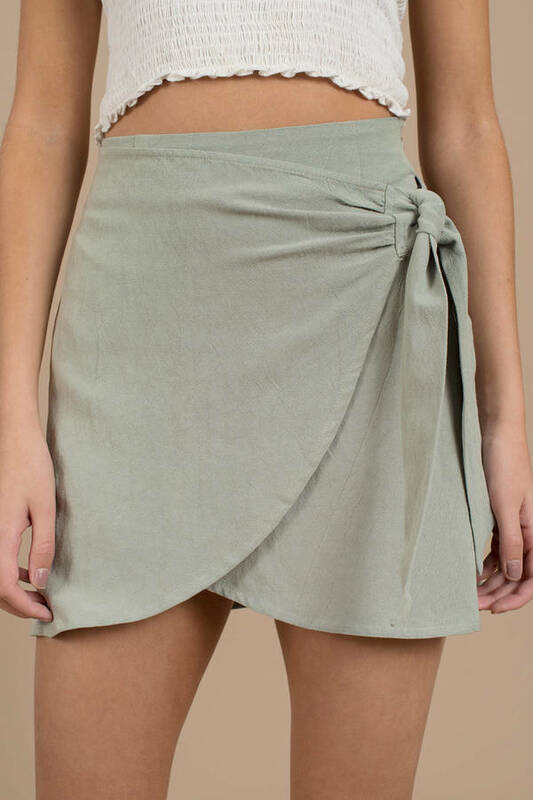 This mini tulip skirt features a linen weave, self-tying wrap, and a high waisted fit. Perfect for work and play, pair with a bodysuit for some extra chic points. Wrap it up - there's no question you'll be the most stylish one around with the Trinity Olive Wrap Skirt! This mini tulip skirt features a linen weave, self-tying wrap, and a high waisted fit. Perfect for work and play, pair with a bodysuit for some extra chic points.